Molecules are the building blocks of life. Like all other organisms, we are made of them. They control our biorhythm, and they can also reflect our state of health. Researchers led by Ferenc Krausz at the Laboratory for Attosecond Physics (LAP) – a joint venture between Ludwig-Maximilians-Universität (LMU) and the Max Planck Institute for Quantum Optics (MPQ) in Munich – want to use brilliant infrared light to study molecular disease markers in much greater detail, for example to facilitate early stage cancer diagnosis. The team has developed a powerful femtosecond light source which emits at wavelengths between 1.6 and 10.2 micrometers. This instrument should make it possible to detect organic molecules present in extremely low concentrations in blood or aspirated air. Myriads of molecules react in highly specific ways to light of certain wavelengths in the mid-infrared region. By absorbing particular wavelengths, each type of molecule in a sample imprints a specific signature on the transmitted beam, which serves as a molecular fingerprint. With a source of broadband mid-infrared light one detects the fingerprints of many molecular structures at once – in a sample of blood or aspirated air, for example. If the sample contains marker molecules that are associated with specific disease states, these too will reveal their presence in the spectrum of the transmitted infrared light. LAP physicists have now constructed such a light source, which covers the wavelengths between 1.6 and 10.2 microns. The laser system exhibits watt-level average output power, and is well focusable which results in a highly brilliant infrared light source. This feature enhances the ability to detect molecules present in extremely low concentrations. In addition, the laser can produce trains of femtosecond pulses [a femtosecond is a millionth of a billionth of a second (10-15 sec)], which makes it possible to carry out time-resolved as well as low-noise and highly- precise measurements. At present, infrared spectroscopy is often based on the use of incoherent light, which provides coverage of the whole mid-infrared region. However, the relatively low brilliance of the beam produced by incoherent sources markedly reduces the ability to detect very weak molecular fingerprints. Synchrotron radiation produced in particle accelerators can alternatively be used, but such facilities are in short supply and are extremely expensive. However, laser-based methods can generate even brighter beams than synchrotrons do. 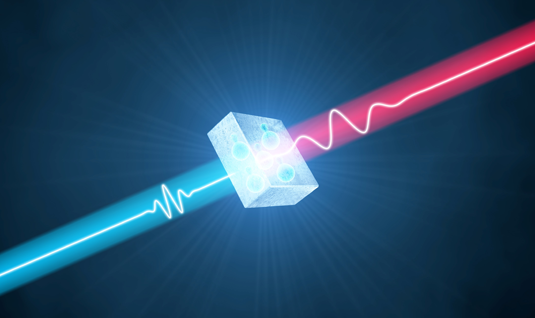 The physicists at LAP have now succeeded in building a coherent light source which produces brilliant laser light over a broad spectral region in the infrared range. That used to be the major drawback of laser sources Moreover, the new system has a much smaller footprint (and is far less costly) than a synchrotron: it fits on a large table.